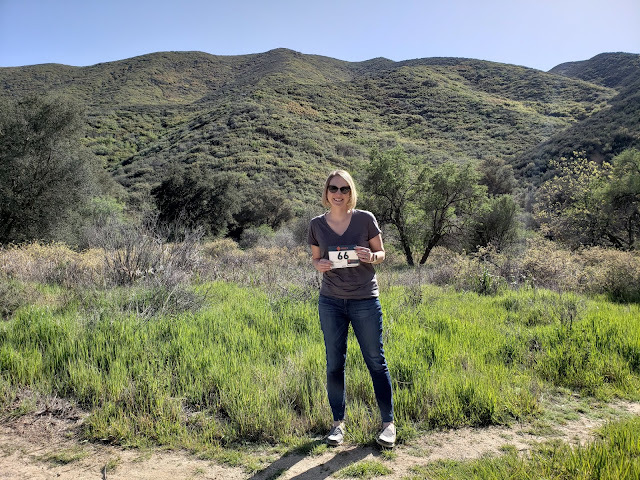 This past Friday was my birthday, and my wish was to meet up with friends for a trail run. 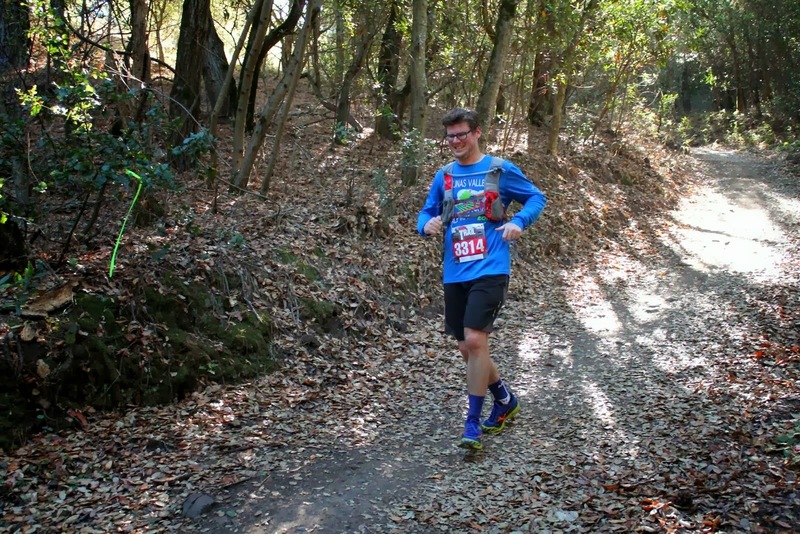 The ITR Berkeley Trail Adventure event corresponded nicely being the day after my birthday, so I invited a few friends for running and lunch. 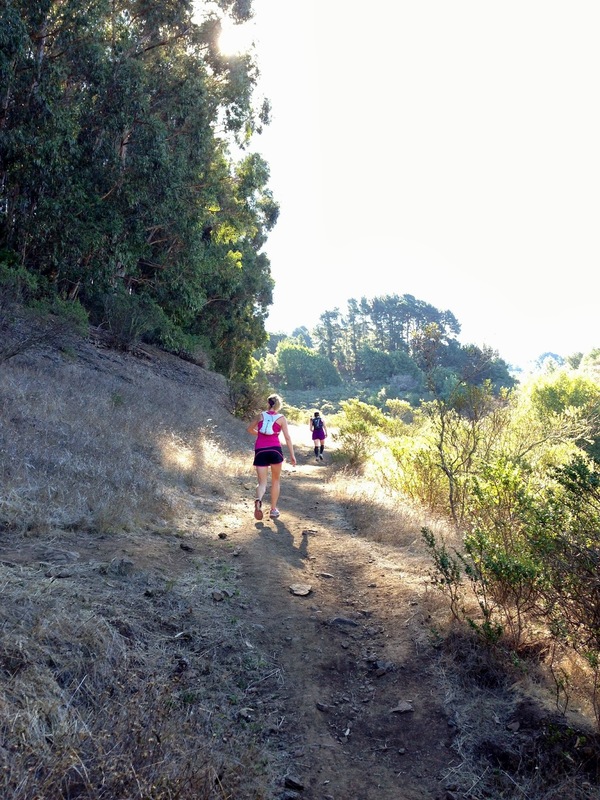 This was a really tough race at Tilden Park, with 2800 feet of climbing for the half, but the trails were gorgeous. The night before the race, I not-so-smartly fueled with the fancy cheese and bread birthday gift Kevin had sent from Zingerman's in Ann Arbor. Although we intended to go out for dinner, we ate a little too much and ended up making this our 'dinner.' We opened a fantastic bottle of 2005 Cabernet Sauvignon from Chimney Rock that we'd been saving, and also finished the evening with Sprinkles cupcakes. Yum! I can't say my stomach felt great the next morning and I felt really icky around miles 3-4, but it subsided. Thank goodness. The half started at a lovely 9 am, meaning no super early morning driving to get to Berkeley. Layla, Kristen, Sophia, and Kevin came to run the half too - thanks all for celebrating with me! The weather was warmer than expected but not bad, and much of the trail was single track which I love. 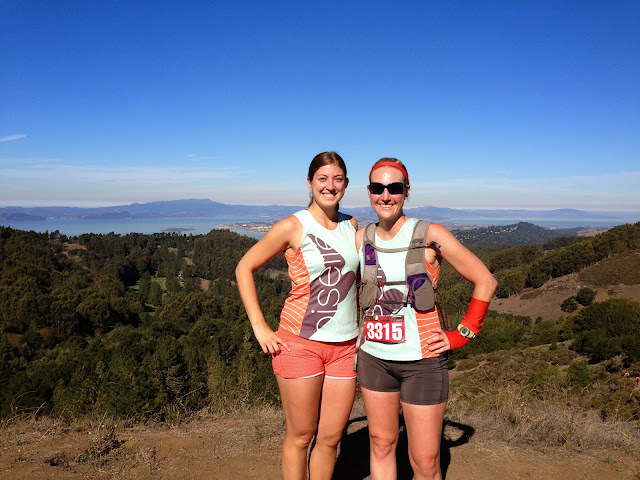 ITR took a few great photos, which they post in Picasa albums for runners to download for free. 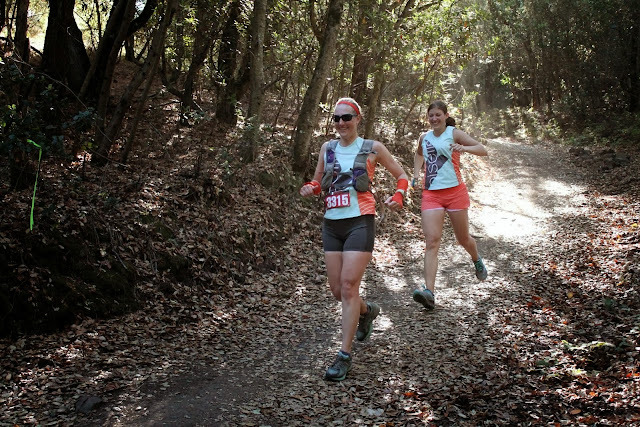 Trail companies rock when it comes to bang for your buck. The course may have had a lot of climbing, but the views at the top were the reward. We could see the bay, SF, and the Golden Gate Bridge. Sophia and I started together, then we found Kristen a bit later and enjoyed the trails together. I was out to enjoy the run more than to race, so we took a few photos and stopped by the aid stations. My big new discovery: brown sugar cinnamon frosted Pop Tarts are great mid-race food. Add that to Cheez-Its as something I can stomach when running! Downhill fun. Love tree covered trail! At the finish line, ITR had a great set up of food including a little bit of everything (potato chips, candy, pretzels, pie, brownies, cookies, much more) plus pop, water, electrolyte drink, and chocolate milk. They gave out gender specific shirts and coffee mugs. I've done one of their races before, and the coffee mugs are a definite highlight. If you run a 50K with them, you get a pint glass. After the race we enjoyed cupcakes and then headed to Pyramid Ale House for lunch. Seriously, there is nothing like a good turkey burger and a beer after a tough run. Thanks again to everyone for coming out and for making my birthday awesome! Looks like you had a ton of fun! Sorry to have missed out!!! Wow awesome celebration and gorgeous run! Sounds super fun! What a great way to celebrate your birthday!! Sounds like a great day - the photos are gorgeous! And I agree with you - a burger after a run is the best! Congratulations and all pics are awesome! Belatedly, happy birthday. LOVE the idea of a birthday half-marathon, I may well steal it come February!! That race t-shirt is SO nice too, I'd wear that every day! Congrats on a great race.